In the name of lazy girl science, I tried the “newest” hair trend called hair plopping. Awful name if you ask me. But seeing as how you plop your hair into a t-shirt I guess it is accurate. 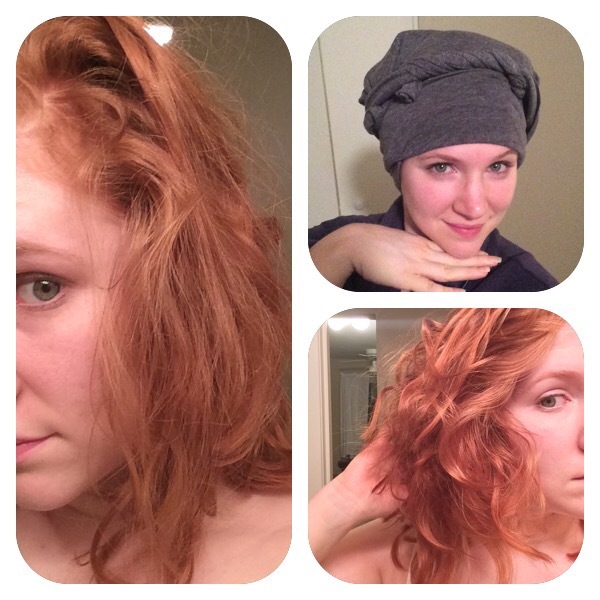 The idea behind this method is to have heat free and frizz free natural curls. Technique – add product do your towel dried hair. Lay out the t-shirt (I used a long sleeve thin cotton shirt) so that the sleeves are closest to you. Flip your hair over so that it is in the center of the shirt and then take the bottom hem and pull it up over your head. Taking the sleeves of the shirt, wrap them around your head and tie them in the back so that they hold down the bottom hem of the shirt. Since I had longer sleeves, I wrapped these back up to the front to tie them off. I felt a little like Girl with the Pearl Earring when this was done! I found various time frames to leave this in ranging from half an hour to overnight. I went with overnight to avoid having to wash my hair in the morning. Results – the results were lackluster. While I have wavy hair, not truly curly hair, this just seemed to make it stick out in odd directions. The frizz free part didn’t work either. All those little wisps around my hairline stood out even more. Though I wouldn’t rule this technique out entirely, if you have very curly hair I think you might have better results.